Review: Royal Marriage Market by Heather Lyons ~ Love.Life.Read. Reviewed from: an eARC provided by Inkslingers--Thank you!! Buy Royal Marriage Market Now!! 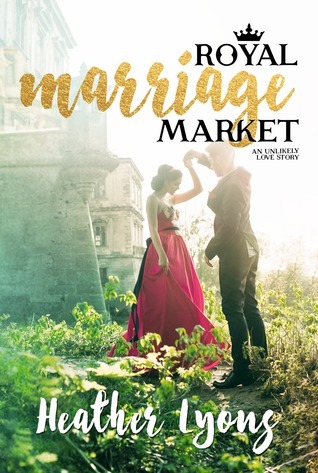 What Did I Think of Royal Marriage Market? Like most in my generation, I admit I have a small fascination with royals. I mean, I am not stalker-ish or anything like that, but Prince William and Duchess Catherine have enliven the royal fan base worldwide, bringing youth, vitality, and project such happiness with their lovely family. What does this have to do with Royal Marriage Market? When I read the book description, I could not help but be intrigued given my prior interest. This is an amusing story--I really liked our main characters, both Christian and Elsa. Both of them are headstrong, confident and poised to take on their country's needs once they are rulers. IF they ever get to that point, that is. The Royal Marriage Market aka RMM is happening and both are being forced to attend as pawns for their dominating parents require as they are bargaining chips that will fetch something their parents need. When you are a royal, your life is not your own and you have have little choice in who you marry, according to the traditionalist Monarch Council (MC). Neither wants to foisted with a loveless marriage or marriage of convenience, so Christian and Elsa bond and seek company with each other. Knowing that each are firm with leaving leaving the Summit in which the RMM is happening without a fiance(e), they find themselves growing more and more attracted to each other--but being both the hereditary heirs of their countries, the match would not be approved by their parents, let alone the MC. The only complaint I have against the book is the ending felt a bit rushed and incomplete. The way it leaves off, it seems likely that a sequel is in the works. I checked Ms. Lyons' website and I did not see anything, but I am hopeful still. I want to know what happens with Christian and Elsa, as well as other characters we meet along the way.